In any business, being able to connect with employees is a vital resource. While working in an office, this may be as easy as walking between desks to check on how a worker’s day is going and monitor their efforts. However, in the homecare industry, the ability to connect with caregivers who work in the field on a constant basis can be a challenging task. One tool that can be of benefit in these efforts is the advanced technology offered by a homecare software or homecare system, such as ClearCare Online. With the communication power offered by a homecare system, agency administrators can spend less time communicating with Caregivers while actually doing a better job of keeping in touch. Let’s look at how! To begin with, homecare software like ClearCare Online allows you to track vital contact information for caregivers – including address, email and phone numbers. With this, the robust abilities of the homecare system allow you to send communications directly from the ClearCare Online platform. 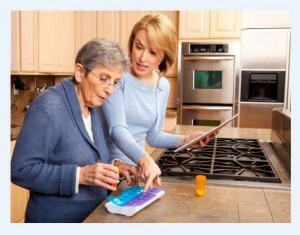 While this may not initially sound like a vital piece of your operational puzzle, the major benefit is the ability of ClearCare online to automatically track these communications and store logs within the homecare system…With no extra work required by the agency administrator or caregiver. In addition to communications via text or email, ClearCare Online homecare system also gives administrators the ability to relay vital tasks for their clients via features within the homecare software using telephony or mobile devices. This allows administrators to be assured that caregivers know what their job entails, as well as see when tasks are completed via real time updates in the homecare software. And while tasks during shifts are important, ensuring caregivers know where to be – and when – is the first vital step. A robust homecare software, such as ClearCare Online, can help with this via automated shift reminder messages and a secure log-in portal where caregivers can log-in and view their schedules at any time. When in it comes to the ability of ClearCare Online to help administrators keep in touch with their caregivers, these suggestions are just the tip of the iceberg. To learn more about how homecare software can change how you communicate with caregivers, give us a call to view a demo at (800) 449-0645!